Kids LOVE stickers and stickers are such a great fine motor activity, not to mention lots of fun! 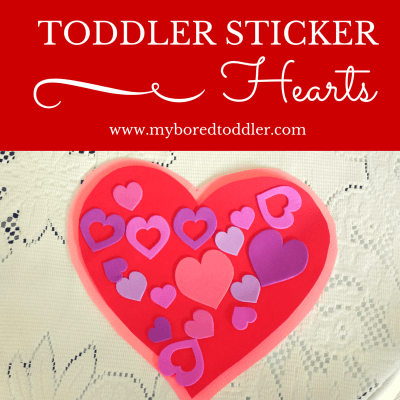 This Valentine’s Day toddler craft was simple and fun. We bought some foam heart stickers and some colored construction paper and off we went. My toddlers had lots of fun making these (in fact they made 5 of them!). You can use these for Valentine’s day, or just for a fun fine motor activity. We made some of them into cards, and hung ribbon on the others to hang around the house. If you’re looking for more Valentine’s activities check out our 10 Great Toddler Valentine’s Day Activities. What a cute Valentine’s Day craft! My toddler loves stickers!